NVIDIA has announced a new version of VXGI. Its Voxel Global Illumination solution is inspired by Sparse Voxel Octree Global Illumination. 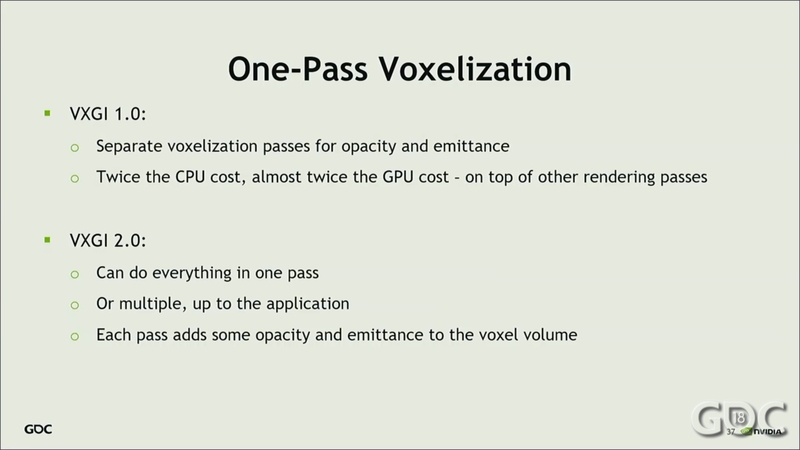 NVIDIA’s senior developer technology engineer Alexey Panteleev shared a presentation several years ago at the GPU Technology Conference in which he introduced VXGI for the first time. However, no commercial video game has yet used VXGI, probably due to its performance cost. Alexey introduced VXAO(Voxel Ambient Occlusion) a couple years later, as a dedicated solution for Ambient Occlusion having several advantages of the current screen-space algorithms such as smoother response to camera motion, finer details, superior image quality and greater accuracy. VXAO is much less resource intensive than VXGI and it was used in Rise of The Tomb Raider and Final Fantasy: PC version. Even though it provides superior image quality, the performance isn’t where it should be to be widespread. Alexey Panteleev and NVIDIA are not giving up yet. Alexey hosted a presentation to show the upgrades in VXGI development that lead shortly to the release of the new VXGI 2.0. 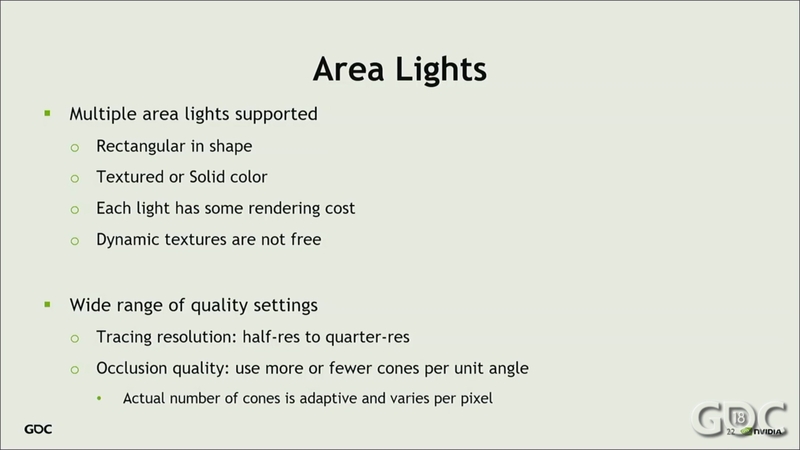 The introduction of the high-quality area lights with shadows is the first advancement they did. However, it’s actually more than just improved quality as NVIDIA will be sharing a dedicated and a separate API for VXAL where the developers will be able to set the perimeters as desired. 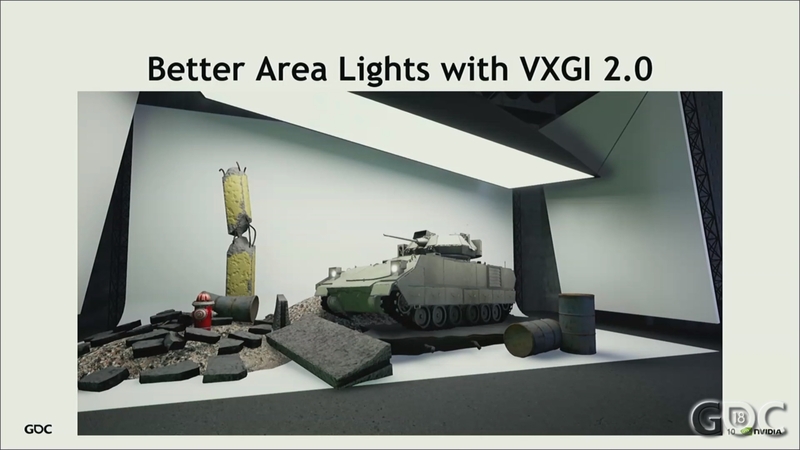 There are several more advancements with VXGI 2.0, like support for custom G-Buffer layouts and view reprojection for VR games, one-pass voxeliztion (that can almost double the performance in most cases according to Alexey Panteleev), simpler and more flexible materials, simpler voxel formats, improved upscaling and temporal filters, simpler tracing controls, and several other advancements were made as well. Generally, VXGI 2.0 should be less resource intensive for the hardware and more accessible for the developers. This combo may lead to more game developers using the VXGI 2.0. 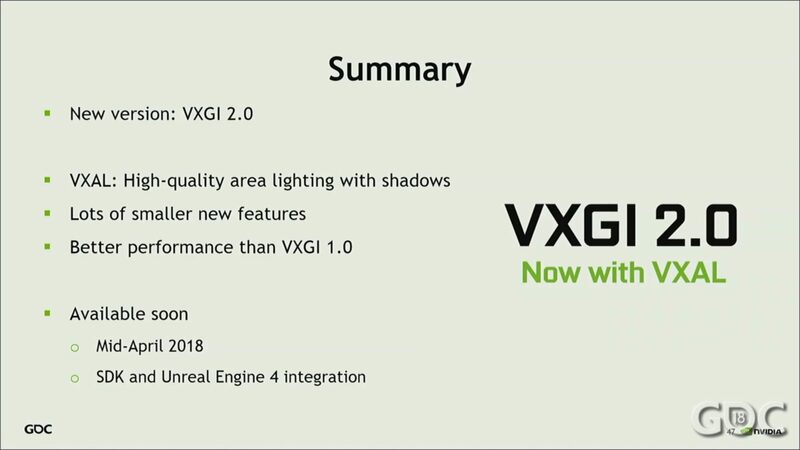 VXGI 2.0 should be available by the end of the month, also for the Unreal Engine 4 through an integration.